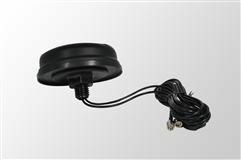 The CMO antenna is a 4G/3G/GSM mulit-band MIMO puck antenna designed for use with 4G routers, terminals and modems that 2 antenna ports. Housed in a durable low profile form factor, the CMO antenna is ideal for cabinets, kiosks, security and mobile applications where a robust, stud-mount antenna is required. Fed by two cables that exit via threaded mounting boss at the bottom of the antenna, a gasket forms a watertight seal against the mounted surface. This model has 2 x 2M cables terminated in SMA-Male plug connectors.